A considerable part of EC legislation concerns agricultural law which is not surprising considering the importance attached to agricultural policy by the European Community Members. As a result of its dominant place in EC law, agricultural law is currently the most developed form of administrative law in the Community. 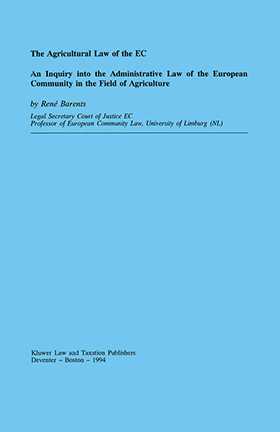 Besides providing helpful information in the field of agricultural law, this book will be useful to those interested in the development of other fields of Community law which might follow the same path. An issue of continuing interest in the context of agricultural EC regulations is the conflict existing between national and community objectives and between the relevant EC Directives and their practical implementation by the EC Member States. Community Agricultural Law: Instrument or Guarantee?